The Paul Newman Rolex Daytona is the most expensive Rolex watch ever sold in October 2017. The renowned actor, director, activist and racecar driver, Paul Newman owned this iconic timepiece. The price of this watch climbed at auction and finally, sold for about £13, 570,000. Now, for those who are wondering what made the Paul Newman Daytona the costliest Rolex watch to be ever sold, continue reading below as we will today have a close look at this watch’s history. The 1968 Paul Newman Rolex Daytona Ref. 6239 sold for nearly £13 million pounds, making it the most expensive watch to be ever sold in the history of Rolex. However, the Bao Dai was earlier the costliest Rolex that sold for nearly £3, 800, 00. The Paul Newman Rolex Daytona is known to feature an ‘exotic’ dial. Moreover, just 2,000 to 3,000 of these watch models were manufactured. The ‘exotic’ off-white dial comes with a black inner ring, a ‘seconds’ track in red, three black sub-dials and Art Deco numerals. The renowned actor was seen wearing this watch frequently on movie sets or while racing and thus, the watch was named as ‘Paul Newman’ in the 1980s. Paul Newman’s wife (popular actress Joanne Woodward) presented Newman the Rolex Daytona that she purchased in a Tiffany & Co. shop. Joanne Woodward had ‘Drive Carefully Me’ engraved in the timepiece’s case back. It served as a reminder to her husband, Paul Newman who had a vigorous passion for driving race cars. When the Swiss-based manufacturer, Rolex launched its Daytona line of chronographs, people had a lesser interest in them. While Paul Newman was frequently seen flaunting the Daytona, the watches became highly sought-after, particularly the one with an ‘exotic’ dial. However, the watch was passed onto James Cox in 1984 who was Paul Newman’s daughter’s boyfriend. Later in 2017, Nell Newman (daughter of Paul Newman) and James Cox decided to put the iconic watch up for auction. They planned to invest a part of the timepiece’s profit on Paul Newman’s charities. The bidding for this highly desirable Rolex watch started at nearly £764,700. While the bidding rose rapidly, it reached a record-breaking offer to about £13,570,000 after twelve minutes. 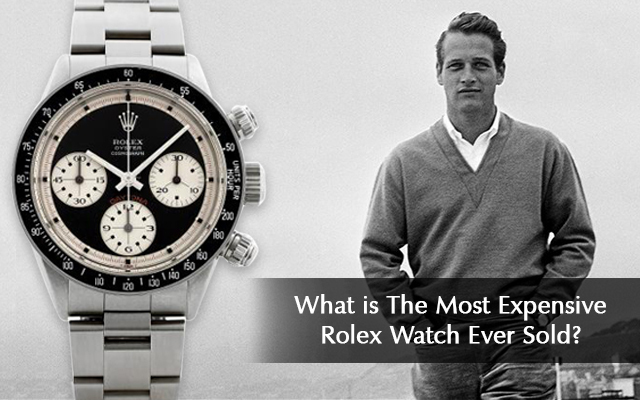 Consequently, the Paul Newman Rolex Daytona became the most expensive Rolex watch ever sold. So, who owns this Most Expensive Rolex Daytona Ever Sold? You may be now wondering who owns this most expensive Rolex timepiece. However, the fact is that the owner of the iconic Rolex Daytona watch remains a mystery. The person was known only to be an anonymous phone bidder at the time of auction. Want to sell your luxury watch? Here at Golden Cash, we provide our customers with the most convenient and straightforward way to sell watches or ‘sell my watch’ in Romford. Customers residing in Romford or anywhere within the Essex can walk into our shop at The Liberty Shopping Centre in Romford straight any time during our opening hours. We will examine every aspect of your watch including its age, condition, model and others right away and determine the final price that we are willing to lend for your timepiece. You will get your final price offer on the spot. Accept it, and we will pay you in cash immediately. Thus, bring your luxury watch you are interested in selling to Golden Cash and receive your offer with no obligation. Previous PostPrevious How to Sell My Jewellery in Essex? Next PostNext Why Diamonds Are So Expensive?